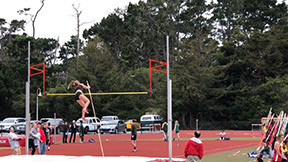 After 12 years the women’s pole vault record was broken by Senior Mary Grebing at the track meet held at Pacific Grove High School on Thursday April 5, 2018. An all time high for this senior who also swims on the high school team and plays middle for the U18 Central Coast Volleyball travel team. She also won the triple jump in the meet last Thursday. Accepted to SDSU in the fall this senior is leaving PGHS on a high.